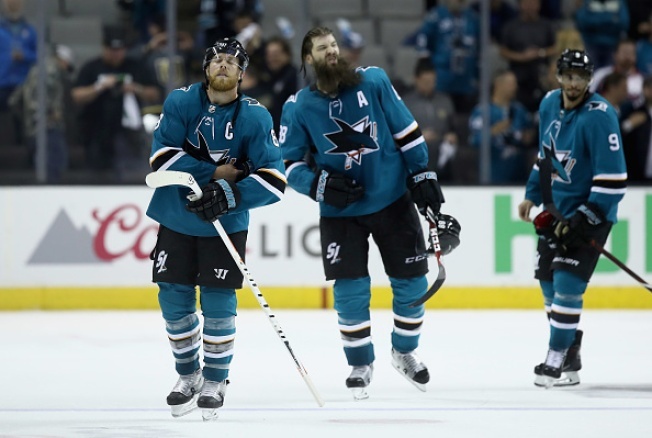 The Sharks’ third-period comeback fell short, and San Jose is now a game away from elimination after the Vegas Golden Knights picked up a 5-3 win in Game 5 on Friday night. James Neal scored with three seconds left in the first period, Alex Tuch added two more, and Erik Haula chipped in another as Vegas took a 3-2 series lead. The Golden Knights owned the first period. They out-attempted (28-19), outshot (15-7), and out-chanced the Sharks (13-7) in the first 20 minutes. San Jose didn’t attempt a shot in the final 2:39 of the period, while Vegas attempted 10, including Neal’s goal. Martin Jones finally cracked under the Golden Knights’ pressure in the second. Sharks forward Tomas Hertl was called for interference in the offensive zone, and Tuch capitalized 33 seconds into the power play. Vegas continued to spread San Jose out with its speed throughout the period, and Haula ultimately scored from a sharp angle in transition to take a three-goal lead. Tuch chased Jones in the third period, tipping a pass over Jones’ shoulder to put the Golden Knights up by four. Kevin Labanc, Tomas Hertl, and Mikkel Boedker all scored in the third as the Sharks mounted a mini-comeback, but Fleury snuffed out any additional chances and Jonathan Marchessault officially ended things with an empty-netter. Fleury wasn’t challenged much early, but made a game-changing save when he was. He turned the puck over behind his net in the first period, but the netminder recovered quickly to deny Mikkel Boedker from in close and keep the game scoreless. Marc-Edouard Vlasic picked up high-sticking and unsportsmanlike conduct penalties in the final minute, while Brenden Dillon and Deryk Engelland were each sent off for a 10-minute misconduct seconds later. Golden Knights head coach Gerard Gallant moved David Perron to the second line, and Perron rewarded his faith. Perron picked up a pair of assists for the second time this series. His puck work kept the play alive on the first, and his hard pass created space for Haula on the second. Neither goal stood as the winner, but he helped Vegas jump out to a big lead early on. The series heads back to San Jose for a potentially decisive Game 6 on Sunday. Puck drops on NBCSN at 4:30 p.m, followed by a postgame edition of Sharks Playoff Central on NBC Sports California immediately after the final horn.